From mouldy walls, concrete paths, screens or driveways, to whole factories and roofs, we pressure-clean it all domestically and commercially with the best adjustable pressure cleaning equipment around – up to 5000psi of pressure available. With over 10 years experience maintaining all types of timber on yachts and terra-firma, we refinish timber homes, decks and balustrades. All surfaces get prepared via sanding or pressure cleaning and re-oiled using every type of timber substrate. Specialising in gentle-jet roof cleaning with all technical and at height know-how, we love nothing more than to do a before & after on your roof. Using adjustable machines and fat heavy jets of water, the very least wear tear is assured. 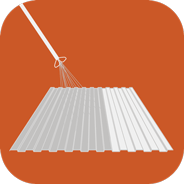 From tin to tile, Full Circle Refinishing provides excellent roof restoration and painting in Northern NSW. With the best equipment available and quality Australian made paints, be sure to give us a call when the time comes to paint or re-paint your roof. The idea behind ‘refinishing’ is to be multi-disciplined in exterior maintenance, including pressure cleaning, roof cleaning and roof painting, timber maintenance and many other services. This makes us a one-stop-shop for many clients. back to it’s original glory. Oliver Hallock of Full Circle Refinishing has been working with people and properties for many years. Originally in yacht maintenance he now brings his exceptional care and quality to all aspects of exterior refinishing including roof cleaning, pressure cleaning, roof painting and timber deck maintenance. Oliver Hallock and his team are based centrally in Tintenbar and Byron Bay NSW and regularly provide roof cleaning, pressure cleaning and refinishing services to Ballina, Lismore, Bangalow and the surrounding areas. With pressure cleaning jobs we generally like to inspect the site, but this can be estimated over the phone very easily if need be too, as well as interrogated using satellite imagery for large pressure cleaning jobs. Estimates for pressure blasting are quite easily done over the phone too, so give us a call and we’ll be happy to discuss. With detailed birds eye views of almost every roof in Australia, plus a short conversation, we can estimate roof cleaning jobs within minutes, arranging a site inspection to follow. 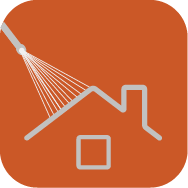 Roof pressure cleaning is a skilled job and whilst every job is completely different, usually a roof clean is quoted purely on a square meter basis. With a qualified painter roofer on deck, we inspect and ensure any maintenance requirements are brought to your attention whilst providing competitive price per metre roof painting quotes. Usually roof paint quotes are on the spot or within 24 hours from the time of our visit in case there are any roof repair items to quote. We always quote timber and deck maintenance and decking jobs in person; due to the nature of timber, there is always a tactile aspect to this process. 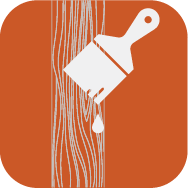 Timber Oiling in Byron Bay is our most frequent request and whilst we work regularly with all decking or timber products, oiling timber along coastal areas is commonly recommended. Our work ethic, quality and integrity speaks for itself. Below are a number of testimonials for our work in pressure cleaning, roof cleaning, roof painting and timber maintenance.